Taken December 20, 1950. It shows an employee of M. Levin at the old Dock Street location working a stalk of bananas. Employees of M. Levin and Company, Inc. at their Spruce Street location on April 24, 1951. Pictured from left to right are: Frank Riggin, William Davis, Martin Levin (in the back checking a banana room! ), Jack Benowitz and Ben Levin (in the white coat). 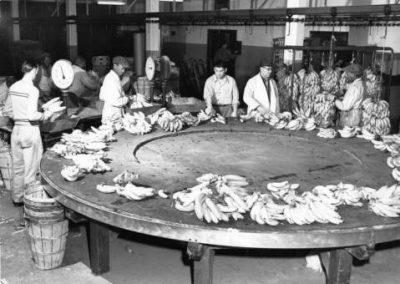 They are sorting bananas on a rotating table. The Ripener – Spring 1998 issue Take a look at this newsletter back from 1998 featuring our banana ripener, Joe McGowan! Joe has been with M. Levin since 1987!